Rhythm & Blues with the Essence of Elvis...Maybe all roads lead to Elvis, or maybe they all originate from him. The theory of six degrees (or less) of separation holds true here and is illustrated on this compilation. Roy Hamilton and Brook Benton were both much admired by Elvis, Jesse Stone wrote songs that Elvis covered or performed and also pulled together the Cues. The Cues included Jimmy Breedlove and Ollie Jones, Stone backed Hamilton on Crazy Feeling, Blackwell also wrote some of Elvis biggest hits and co-wrote with Winfield Scott (also on the MGM We Wrote Em We Sing Em compilation and working with Jesse Stone and the Cues). Lavern Baker directly responds to the Kings recording of Little Sister with Hey Memphis and Elvis also covered her song Youre The Boss (recorded with Bass man Jimmy Ricks, also connected to Ollie Jones via the Ravens) with Ann-Margret for Viva Las Vegas, Clarence Paul wrote a song Roy Hamilton had a hit with, Elvis sang one of Ollie Jones songs, Blackwell wrote for Elvis and Dee Clark and Elvis and Dee Clark also worked with the same drummer, Jerome Stump Monroe.the permutations are almost infinite. 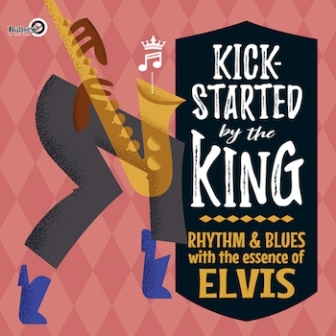 This compilation pulls together recordings by a roster of stars that are influenced by or evocative of Elvis style or material. Alternatively, Elvis was influenced by some of these singers or songs. We invite you to listen to this selection and ponder for yourselves the interconnectivity and small world of Rock and Roll.or maybe just enjoy the music!